Charismatic rapper, dj and producer Dj Khaled pleased his fans with another studio attempt. His fifth record was titled We The Best Forever and it saw the light in the summer of 2011. According to that name we can easily assume that it became a logical continuation of an album We The Best of 2007. Back then many musicians took part in creation of that record, and the result proved to be more than just satisfying. To work in a team is always a good and interesting experience, especially if everything that had been planned is realized after all. Probably DJ Khaled decided to repeat his successful experience and invited his colleagues in the industry to collaborate. Should it be mentioned that everybody agreed – well, who does not want to work in a team, which consists of professionals? Thus, We The Best Forever proudly presents numerous famous performers, such as Drake, Rick Ross, Lil Wayne and many others. Of course, the main role was played by Dj Khaled himself, which is not a surprise. He has a reputation of a talented musician and a producer, who has an amazing intuition. It took him two years of hard work to prepare that strong long play. 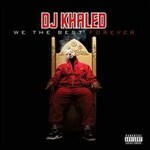 Right after the release of We The Best Forever it made a long way to the fifth line in the Billboard chart, which means that this album became Dj Khaled’s most successful work so far in this aspect. The sound of the musician’s new studio attempt is impressive; however his previous works could not be blamed for the lack of quality. The opening act I'm On One is a truly powerful track, and after listening to it there will be hardly a person who will doubt the fact that We The Best Forever had been prepared in an incredibly careful way. Audacious I’m Thuggin will please all lovers of old-school hip-hop. Nevertheless the performer once again proved that he is capable of creating miscellaneous music, which may fit any mood. Thereby, It Ain’t Over Til It’s Over proved to be rather soft track, while Mary J. Blige’s voice sounds here just perfectly. The composition Sleep When I’m Gone, recorded alongside with Busta Rhymes, Cee Lo Green and The Game is definitely another adornment of the long play. The arrangements are quite elaborated; they simply do not have any superfluous elements. Well, such kind of a background makes the rapper’s voices sound even more confident. After acquaintance with We The Best Forever none of the listeners will have a slightest doubt in the fact that all the musicians who took part in creation of that long play strained every sinew. Every aspect was worked out really well: music is not quite innovative, but still it sounds high-class. The lyrics also deserve some special attention: Dj Khaled and his colleagues had something to share with listeners. Contemporary hip-hop is not static, and We The Best Forever demonstrates it in a full scale. One can find here energetic tracks, like I'm On One, Welcome To My Hood and many others, not less atmospheric compositions. Thus, Dj Khaled found place for lyrics on his new long play: It Ain't Over Til It's Over and Legendary somehow combined a strong energy charge and a lyrical mood. Dj Khaled’s new creation turned out to be a notable one, and in fact that album became one of his best works so far. The performer achieved that with the help of his colleagues – the team work always brings positive sides, right? And who knows, whose voices and whose melodies will the music lovers get on the rapper’s following studio attempt? Anyways, the quality of his long plays is not doubted by anyone anymore.